Nelson - Queen City of the Kootenays - Nelson Realty Ltd.
Nelson lies upon the shores of the west arm of Kootenay Lake in Southeastern British Columbia. 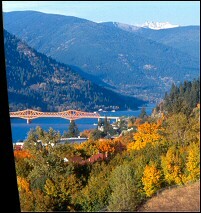 Surrounded by the Selkirk mountains and lush forests, it has been hailed as one of the most picturesque town in Canada. Adding to its small town charm, Nelson also has the highest per capita number of heritage buildings in BC, earning it the title of the "Heritage City". Nelson was first founded in 1886, when brothers Osner and Winslow Hall discovered rich silver and copper deposits in the surrounding mountains. Building on the shoulders of the mining and forestry industries, the new town grew quickly and was incorporated as a city in 1897. Today, Nelson thrives on recreation, tourism, and a powerful attraction as an ideal place to live. There is also a strong arts community in Nelson, and it has been named the Best Small Arts Town in Canada. This is due, in no small part, to the presence of both the Kootenay School of the Arts and the arts programs at Selkirk College, both of which have campuses within the City. For the outdoor enthusiast, the area around Nelson is a giant playground with cycling, golf, swimming, sailing, fishing, hiking, and more. The mountain biking trails are quickly earning an international reputation for their quality, variety, and beauty - a secret the locals have known for years. The sandy beach at Lakeside Park is an excellent place to take a cool dip on a hot summer day or go windsurfing. For the fisherman there are lots of lakes and streams and Kootenay Lake's cool deep waters create some of the best rainbow and Dolly Varden trout fishing in North America. The scenic golf courses offer a challenge for all skill levels and of course Kootenay Lake offers the boating enthusiast every possibility from kayak or canoe trips to water skiing to a leisurely cruise in a houseboat. Nelson is the type of town you visit once and never forget. The great scenery, varied activities, and friendly people make Nelson a vacationers hot spot and a sought after city for families.